Hamas Chief Ismail Haniyeh visits Hamas' security chief in the Gaza Strip, Tawfeeq Abu Naeem, as he lies on a bed at a hospital in Gaza City October 27, 2017. GAZA - Hamas’ security chief in the Gaza Strip was wounded in a car bombing on Friday in what the Islamist group called a failed assassination attempt. The attack came as rival factions are trying to implement a new agreement meant to end a 10-year rift that has effectively split the Palestinian territories between Hamas in Gaza and the more mainstream Fatah in the occupied West Bank. 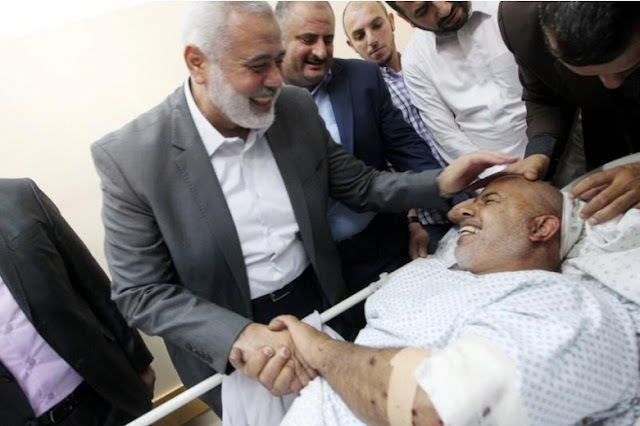 Tawfeeq Abu Naeem, Hamas’ head of security in Gaza and a strong supporter of the reconciliation deal, was lightly wounded when his car exploded outside a mosque, Hamas said in a statement. Hamas, which has been quick to blame Israel for similar attacks in the past, did not say who it believed was behind the bombing, suggesting it could also be the work of a radical jihadist Salafi group that opposes the Palestinian rapprochement. Asked about the explosion in Gaza, Israel’s military said it did not comment on foreign reports. Hamas has stepped up a security campaign against Salafi groups and recently detained a senior operative. Hamas also has improved ties with Egypt, which is battling Islamist groups across the border in the Sinai peninsula. Some disputes arose this week in implementing the reconciliation deal. Senior Fatah officials traveled to Gaza this week from the West Bank to take control of two government offices there, but they turned back, saying Hamas officials refused their authority. A Fatah spokesman later said the issue was being resolved. Hamas’ security chief in the Gaza Strip was wounded in a car bombing on Friday in what the Islamist group called a failed assassination attempt. The attack came as rival factions are trying to implement a new agreement meant to end a 10-year rift that has effectively split the Palestinian territories between Hamas in Gaza and the more mainstream Fatah in the occupied West Bank.